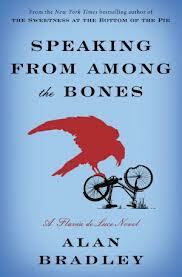 In this fifth Flavia de Luce mystery, we are treated to another delightfully mixed up mystery in which we learn even more about the residents of Bishop's Lacey, both guilty and not guilty. This time around, the victim is church organist Mr. Collicutt, found in the tomb of the one and only St. Tancred, who is supposed to be exhumed for the 500th anniversary of his death. What follows is Flavia doing her own detective work, as usual, behind the back of the local law enforcement (and to their great annoyance and stress, of course). During the solving mystery, which is convoluted in the best possible way (and very realistically, in my opinion), we meet new characters, some of whom are connected to Harriett, Flavia's mother. We also delve deeper into the histories of the vicar, his wife, and the de Luces themselves, understanding each a little bit more. Bradley creates the best characters. Flavia is wonderfully clever, often ingenious, yet still has the curiosity and sulkiness a child of 11 should have. Her family also grows more sympathetic in this book, though of course Flavia and her sisters still tend to go at each other, and their father is still distant—yet they seem to grow closer here, which I loved to see. And the secondary characters continue to be developed, though the eyes of Flavia. Have I mentioned the humor yet? Despite the fact that this is a murder mystery, Flavia recounts everything with her usual wit and wry observations. I already used this word in this review, but I'm going to use it again: delightful. This series is nothing short of delightful. Disclaimer: I received an e-galley of this book from NetGalley. I just read my first Flavia novel -- The Sweetness at the Bottom of the Pie. I enjoyed it, and will have to add the others to my TBR list. Thanks for the review! Oh my gosh, I love the Flavia De Luce books! And excited (and nervous) to hear how the ending is huge! I placed a hold on it at the library, but it hasn't come in yet. Soon, I think. Love, love, love this series. Hate that there's a cliffhanger, though! Can't wait. Thanks for the great review. I know! We have to wait until early 2014 according to Alan Bradley's website. Booo, but yaaay at the same time. I love Flavia de Luce books! I've missed reading a few of them but I have read two I think. I guess I should read all of them before starting this one then? I'm excited to know about this huge cliffhanger at the end of this one :) Great review, I can't wait to read this one!! It's worth reading the others to get a feel for the characters and how they've grown/changed, plus there are some new ones introduced. But if you REALLY want to skip them, I don't think you'll be that confused. They're not really necessary, but they are enjoyable and make the experience that much better. I need to get back to reading this series. I thought it was really cute and fun!! !